A barber restoring wooden chairs to use in his new salon uncovered one thought to have been used by former Leeds United and England manager Don Revie. Sean Birch, 53, who runs Sean's Barber's in Yeadon, bought six of the chairs from a man in Shipley, West Yorkshire, to go in his waiting room. Once he stripped them back he found names including Mr Revie's and the 1992 title-winning chairman Leslie Silver. One chair was for RP Ziff, the name behind Stylo football boots. Stylo Matchmakers was a brand made famous during the 1960s and 1970s by footballing heroes such as Pele, George Best and Kevin Keegan. 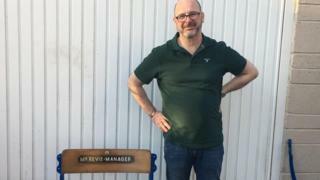 Mr Birch said: "I found 'Mr Revie - Manager' on the chair - it came as a shock to me; my wife says she's never seen me happier. "I was smiling more than I did on my wedding day, apparently." Don Revie was the club's legendary manager whose reign at Elland Road spanned between 1961 and 1974, bringing Leeds United a level of unprecedented success. He took the club into the top tier of English football and made them into one of the hardest teams to beat in Europe. "He won every major domestic honour and two European trophies with a brand of skilful and tough football which unfairly gave them the nickname 'Dirty Leeds'," said BBC's Radio Leeds' Adam Pope. As a player Revie won the FA Cup with Manchester City and won six England caps. He was awarded an OBE in 1969 and after suffering from motor neurone disease he died aged 61 in 1989. The 2009 film The Damned United brought Revie back to the forefront of many a Leeds United fan's mind, portraying the club when Brian Clough took over from him for an ill-fated period of 44 days just after Revie had taken the England manager's role. Mr Birch, who is moving his barber's and ladies' hairdressers business to the former Yorkshire Bank building in Yeadon, said: "We have some flip-up chairs already, but they are old cinema chairs but they have got a little bit wrecked. "We wanted something a little bit older, something wooden and quirky... I came across some mucky old ones locally. "They were a bit of a mess but I bought them and started stripping them down, and came across something that I wasn't expecting." The chairs say LFC on them rather than LUFC, making him believe they had been in Elland Road when the stadium was first built. Mr Birch added: "Finding Leslie Silver was a fantastic find, because that was my youth, when Leslie came along and resurrected Leeds United in the '80s. "I'm looking forward to getting the shop open and showing them off, but I feel some of them should go back to Elland Road." Mr Birch took his chairs to be valued on the Antiques Roadshow which will be broadcast on Sunday 3 March on BBC One at 19:00 GMT, and on iPlayer afterwards.